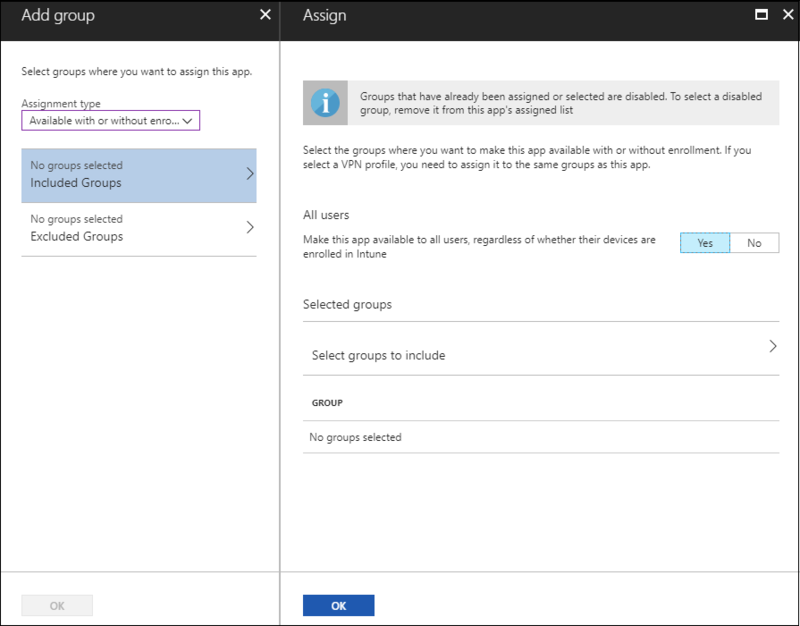 In Intune, you can determine who has access to an app by assigning groups of users to include and exclude. Before you assign groups to the app, you must set the assignment type for an app. The assignment type makes the app available, required, or uninstalls the app. To set the availability of an app, you include and exclude app assignments to a group of users or devices by using a combination of include and exclude group assignments. This capability can be useful when you make the app available by including a large group, and then narrow the selected users by also excluding a smaller group. The smaller group might be a test group or an executive group. 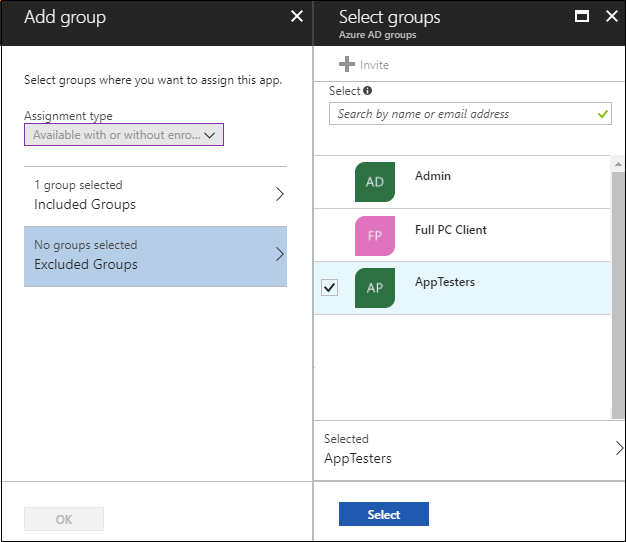 When you exclude groups from an app assignment, you must exclude only user groups or only device groups. You can't exclude a mixture of user groups and device groups. Intune doesn't consider user-to-device association when it excludes groups. Including user groups while excluding device groups is unlikely to produce the results you need. Inclusion takes precedence over exclusion. For example, if you target an iOS app to All Users and exclude All iPads, the net result is that any user who is using an iPad still gets the app. However, if you target the iOS app to All Devices and exclude All iPads, the deployment will be successful. When you set a group assignment for an app, the Not Applicable type is deprecated and replaced with exclude group functionality. Intune provides pre-created All Users and All Devices groups in the console. The groups have built-in optimizations for your convenience. It's highly recommended that you use these groups to target all users and all devices instead of any "all users" or "all devices" groups that you might create yourself. Android enterprise supports including and excluding groups. You can leverage the built-in All Users and All Devices groups for Android enterprise app assignment. Select All services > Intune. Intune is located in the Monitoring + Management section. In the Intune menu, select Client apps. In the Client apps pane, select Apps. The list of added apps is shown. Select the app that you want to assign. A dashboard displays information about the app. In the Manage section of the menu, select Assignments. Select Add group to add the groups of users who are assigned the app. 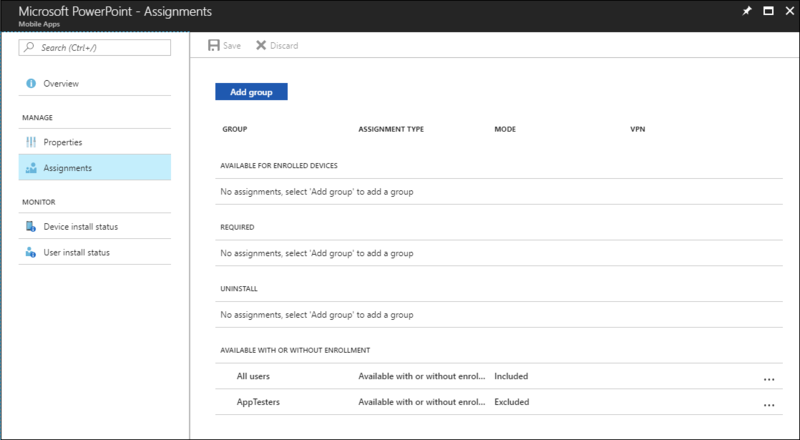 In the Add group pane, select an Assignment type from the available assignment types. For the assignment type, select Available with or without enrollment. Select Included Groups to select the group of users that you want to make this app available to. 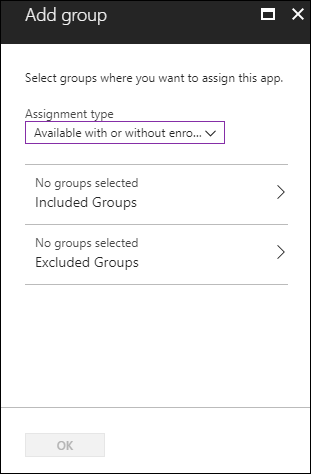 When you add a group, if any other group has already been included for a specific assignment type, the app is preselected and can't be modified for other include assignment types. The group that has been used can't be used as an included group. Select Yes to make this app available to all users. Select OK to set the group to include. Select Excluded Groups to select the groups of users that you want to make this app unavailable to. Select the groups to exclude. This makes this app unavailable to those groups. Select Select to complete your group selection. In the Add group pane, select OK. The app Assignments list appears. Click Save to make your group assignments active for the app. When you make group assignments, groups that have already been assigned aren't available to be modified. If you want to select a group that currently isn't available, first remove the app from the app’s assigned list. To edit assignments, in the app Assignments list, select the row that contains the specific assignment that you want to change. You can also remove an assignment by selecting the ellipse (…) at the end of a row, and then selecting Remove. To change the view of the Assignments list, group by Assignment type or by Included/Excluded. For more information about including and excluding group assignments for apps, see the Microsoft Intune blog. Learn how to monitor app information and assignments.